These flowers are gorgeous and one of my favorites! They are gorgeous when in bloom and the flowers are very colorful and delicate. The colors on this plant are simply amazing, they blend so well together and really make it stand out. Purple is my favorite color, so naturally I couldn't wait for these to bloom. They are amazing. I planted several of these in a shade garden and have been really happy with them. The color on these are simply amazing! Thank you for the great product! Bird's Foot Violet - 12-18"
The standard blue violet has a distinctive blue rounded star-shaped petals and semi-circular leaves. A mature plant can grow to 6 inches across and 4 inches high. This plant grows best in a temperate climate with adequate water and sun. Rich dark soils are the ideal for these plants which can be found in wooded areas and slopes. The growing period for the Blue Violet is from mid-spring to late spring. 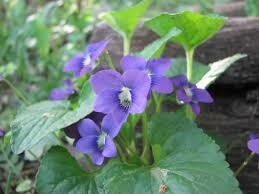 Blue Violet plants are fantastic and can be used in many ways. This plant can be used in the treatment of acne, psoriasis and also eczema when created into an ointment. It also helps with rheumatic conditions. This plant also works well as a diuretic, expectorant and also anti-inflammatory. The Blue Violet is a perennial groundcover which is native to North America's east coast. This plant has herbaceous tendencies and does die back in winter seasons. However, this flowering plant has an extended flowering period, and when it does flower, is quite gorgeous. This plant produces small, vibrant blue flowers with five neat, soft petals. The foliage of this plant is vibrant emerald green. This perennial is likely to attract various species of pollinators to the garden or landscape area. This plant prefers soils that are moist but also well drained in composition. It has the botanical name of Viola Papilionaceae. Blue Violet is also classified as a wildflower and certainly lives up to that.